FoPlus folding openers: aesthetics and functionality. Caldwell’s FoPlus opener range offers an innovative take on the current folding opener market. Unlike other products, the FoPlus combines the performance benefits of the standard Pace folding openers with a vast range of aesthetic choices, offering a number of contemporary design, finish and colour combinations. The FoPlus is unique in the folding opener range as it is not only able to offer the practicality and functionality of standard folding opener ranges, but also combine it with a variety of styling choices. For specifiers and fabricators requiring window hardware which can provide the best in customisable aesthetics, the FoPlus is the obvious folding opener choice, The FoPlus can give the end user an attractive appearance, and also the ability for consumers to personalise their decor to their exact tastes through colour coordinating the FoPlus with their property’s interior. For even greater looks, the FoPlus range (unlike other products) does not require any visible fasteners to fix folding openers to the window, which serves to further improve the overall aesthetic of the window itself. The FoPlus is customisable with two body style options, one for window sill applications, and one for transoms. FoPlus mouldings can also be colour customised and are available in the choices of red, blue, yellow, green and black. 110 Type: Intended for transom application use only. 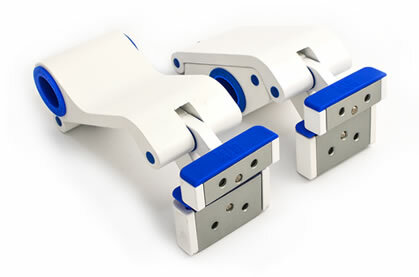 Both arms of the opener are the same width for clean aesthetics when viewing from below. Stylish design complements contemporary window designs. 112 Type: Specifically designed for window sill applications only. The lower arm is slimmer than the upper, as to provide a discreet aesthetic. Both the 110 and 112 Type folding openers can be used on their own, or joined with a tandem bar for larger configurations.